Tries: North 2, Hook. Cons: S Jones 2. Pens: S Jones 2. Tries: Alberts, Matfield. Cons: M Steyn 2. Pens: M Steyn 5. Replacement Willem Alberts turned the game on his South Africa debut as Wales' Tri-Nations misery continued in a scintillating clash in Cardiff. Teenager George North scored two stunning tries on his Wales debut, with James Hook adding another as the home side found their attacking flair. But the Boks hit back after the break as Alberts and record-breaking captain Victor Matfield crossed for tries. 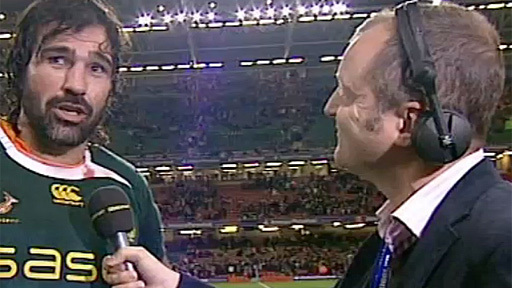 Morne Steyn kicked 19 points to underpin South Africa's win over Wales. Victory at the Millennium Stadium helped the Springboks regain second spot in the world rankings and keep their grand slam dreams alive. Wales have won one just one of their 12 games against Tri-Nations opposition under coach Warren Gatland, and have only beaten South Africa once in 104 years of competition - in 1999 in Cardiff. Their next chance to overcome the Boks will be in Wellington, New Zealand, on 11 September in the opening game of their World Cup campaign. Wales' hopes of a psychological boost ahead of that showdown had been rocked by the late withdrawals of Gethin Jenkins and Dan Lydiate from the starting 15. From the opening kick-off, Jonathan Thomas was turned over as he collected the ball, gifting the lethal Steyn an early penalty. The home side fired straight back with a multi-phased attack, exciting the die-hards in the sparse 54,027 Millennium Stadium crowd by choosing to boot a kickable penalty to touch. They were rewarded as Stephen Jones' delightful slip pass in midfield sent teenage debutant North on a clear run to the line, the Boks crying foul as Tom Shanklin's off-the-ball collision with Jean de Villiers created the space for the giant wing. Bryan Habana went close as South Africa fired straight back to the Welsh line, only to be thwarted as Mike Phillips forced Ruan Pienaar to knock on and a huge defensive scrum cleared the danger. The fact that Wales had rediscovered their strike power was evident as fit-again full-back Lee Byrne expertly fielded a long kick into the Wales 22 and released the 6ft 4in North for a powerful run into the Springboks' half. The ball was quickly recycled and fired to Shane Williams on the left, the veteran not to be outdone by wing partner North as he jinked inside the exposed Jannie du Plessis, before delivering an inside pass for Hook to canter in under the posts. Steyn clawed back a penalty to atone for an earlier miss, Hook wide with a long-range effort before Jones' third successful kick made it 17-6 to the home side. Pressure continued to mount on the visitors, who were desperate to mark captain Matfield's 103rd cap - a Springbok record - with a victory. But it was the lock legend's opposite number Alun Wyn Jones and late stand-in Andy Powell who were more prominent with their driving play, as much-criticised Wales half-backs Jones and Phillips ran the show with aplomb. With half-time looming referee Steve Walsh, officiating his first Test since 2008 after disciplinary problems with the International Rugby Board, then sparked outrage in the crowd. 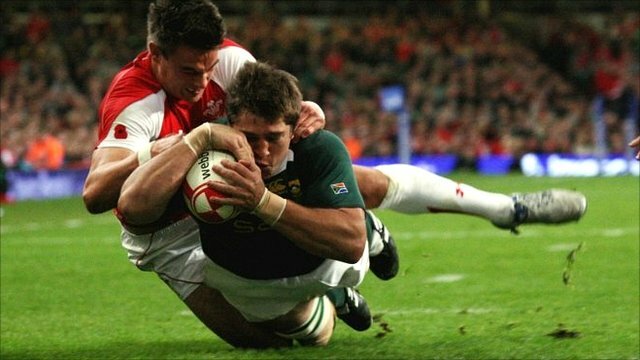 With the stadium clock having passed the 40-minute mark he allowed the Boks to play an attacking scrum in the Wales 22. Wales repelled them with some furious defence, but conceded a penalty that allowed Steyn to reduce the gap to eight points at the belated break. Williams left the fray at half-time with arm and shoulder injuries from a heavy Francois Steyn tackle that could threaten his part in the rest of the November series, to be replace by Chris Czekaj. But Byrne and Martyn Williams got Wales straight back on the front foot and Stephen Jones extended the lead with a penalty. The points were cancelled out as the Boks' heavy driving game set up Morne Steyn for his fourth kick, South Africa ratcheting up the power game by bringing on hefty back-rower Alberts for his Test debut. Wales wilted under the physical onslaught, man-of-the-match Pierre Spies also to the fore, but were granted a temporary reprieve as Bjorn Basson knocked on with the try line beckoning. Another penalty chance came, Matfield choosing to go for the corner and keep Wales on the rack. The reward came as a superb driving line-out opened up the blind-side, the ball fired to Alberts who resisted Czekaj's brave challenge to plough over. The grip did not relax one bit as the Springboks eight drove back to the Wales 22, and when the ball was spun to Matfield in midfield the record-breaking powerhouse could not be denied the try that took South Africa back in front. With Wales reeling, a charged-down kick got them back on the front foot with attacking ball on the visitors' 22. Stephen Jones showed great vision with a hanging cross-field kick to the right-hand corner that North was able to gather for his second try, Jones narrowly missing with the conversion to leave his side trailing by a single point. Alberts' driving play continued to cause chaos, though, the Boks close to another try but settling for a Steyn penalty. Hook sent Shanklin through on a clean midfield break, but the centre failed to spot Byrne outside him and the chance went begging. The atmosphere reached fever pitch as Wales maintained a sustained assault on the visitors' line through to the 84th minute, but the obdurate Boks held out for their 12th successive win over Wales. 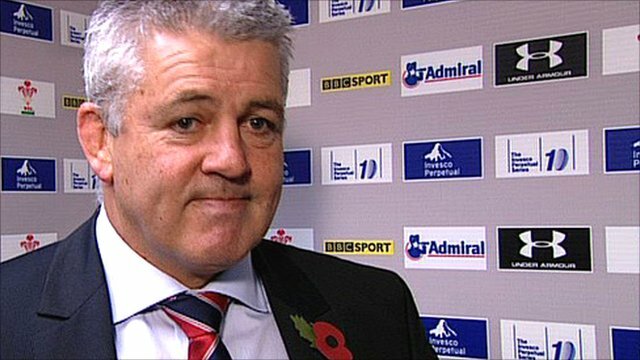 Gatland's men have now won just one of their last 11 Tests, a record they will be desperate to improve against Fiji on Friday. Wales: Lee Byrne (Ospreys); George North (Scarlets), Tom Shanklin (Blues), James Hook (Ospreys), Shane Williams (Ospreys); Stephen Jones (Scarlets), Mike Phillips (Ospreys); Paul James (Ospreys), Matthew Rees (Scarlets, capt), Adam Jones (Ospreys), Alun Wyn Jones (Ospreys), Bradley Davies (Blues), Andy Powell (London Wasps), Martyn Williams (Blues), Jonathan Thomas (Ospreys). Replacements: Huw Bennett (Ospreys) for M. Rees (72), John Yapp (Blues) for James (71), Ryan Jones (Ospreys) for Powell (60), Deiniol Jones (Blues) for AW Jones (73), Richie Rees (Blues) for Phillips (69), Andrew Bishop (Ospreys) for Shanklin (39-41 blood bin), Chris Czekaj (Blues) for S. Williams (43). South Africa: Gio Aplon; Bjorn Basson, Frans Steyn, Jean de Villiers, Bryan Habana; Morne Steyn, Ruan Pienaar; Pierre Spies, Juan Smith, Deon Stegmann, Victor Matfield (capt), Bakkies Botha; Jannie du Plessis, Bismarck du Plessis, Tendai Mtawarira. Replacements: Chiliboy Ralepelle for B. du Plessis (73), CJ van der Linde for J. du Plessis (75), Flip van der Merwe for Botha (60), Willem Alberts for Stegmann (46), Francois Hougaard for Pienaar (59), Zane Kirchner for Habana (73), Patrick Lambie for M. Steyn (67).